We apply evolving functional network analysis, a tool for studying temporal changes of the spatial co-variability structure, to a set of Late Holocene paleoclimate proxy records covering the last two millennia. The emerging patterns obtained by our analysis are related to long-term changes in the dominant mode of atmospheric circulation in the region, the North Atlantic Oscillation (NAO). We obtain a qualitative reconstruction of the NAO long-term variability over the entire Common Era. This paper investigates the signature of melt ponds in satellite-borne synthetic aperture radar (SAR) imagery. A comparison between helicopter-borne images of drifting first-year ice and polarimetric X-band SAR images shows relations between observed melt pond fraction and several polarimetric SAR features. Melt ponds strongly influence the Arctic sea ice energy budget, and the results imply prospective opportunities for expanded monitoring of melt ponds from space. This comment on the paper by Lovejoy and Varotsos demonstrates that their methods for establishing nonlinearity in the global temperature response in climate models are flawed. One of their methods is based on an invalid approximation, which when corrected does not falsify the hypothesis that the response is linear. This conclusion is enforced when internal variability in the models are accounted for. The other results in their paper are also shown to be reproduced by linear-response models. 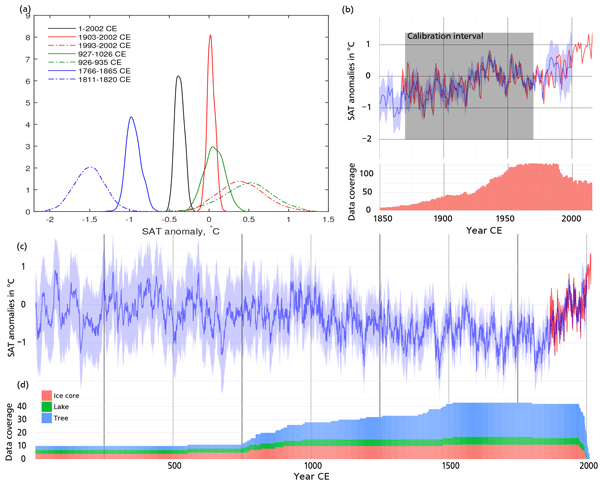 We present a Bayesian approach to simultaneously constrain the age models associated with time-uncertain proxies and inferring past climate in space and time. For the sake of exposition, the discussion focuses on annually resolved climate archives, such as varved lakes, corals, and tree rings, with dating by layer counting. Numerical experiments show that updating the probabilities associated with an ensemble of possible age models reduces uncertainty in the inferred climate. Climate indices of the past are often reconstructed using proxy information from various locations and it is assumed that the relationship between the two does not change over time. As this assumption has been recently questioned, we use a climate model to examine the effect of these changing relationships on the skill of El Nino-Southern Oscillation variance reconstructions. Our study finds that these changes reduce reconstruction skill, while also showing how this impact can be mitigated.